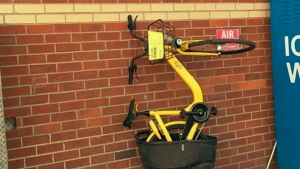 In Dallas, where just 0.2 percent of the population commutes by bike, at least five competing dockless bike-share companies are flooding the city with more than 20,000 brightly colored bikes. Hardly anyone appears to like or use them—at least not properly. Bikes are everywhere—in trees, tossed into Trinity River, piled up in random people’s yards. Someone cut one in half and bolted it to a telephone pole, according to Jared White, who works on alternative transit at the city’s department of transportation. “Some are sitting for days, and weeks, and months in some cases,” he told Motherboard over the phone. There’s even an Instagram account dedicated to documenting the chaos called Dallas Bike Mess. It’s gotten so bad that City Hall recently told the companies to clean up, or it’ll clean up for them—and they may not like what the city does with their bikes. in Dallas, a subcommittee on the bike-sharing experiment will reconvene this month to evaluate its results. The city had originally taken a free-market approach to the project, allowing anyone to come in and operate as they saw fit—but it’s become clear that’s no longer the best option. “The next step will be some kind of regulation,” said White.